This post expects a good knowledge of WordPress and PHP, and an understanding of filters and actions. This was written for WordPress version 3.0.x. 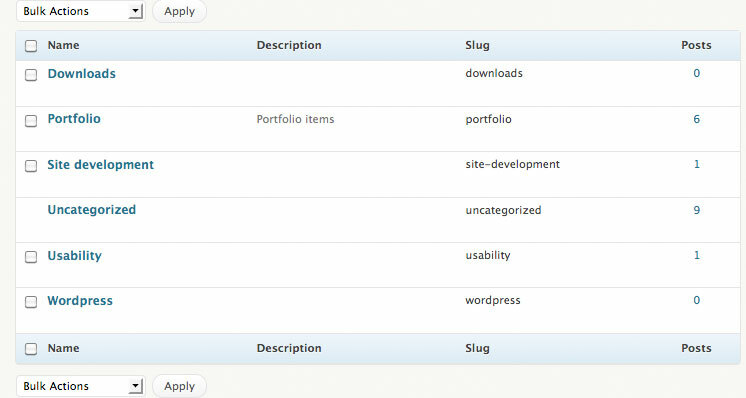 The Edit Categories panel (below) has standard categories of ‘Name’, ‘Description’, ‘Slug’, and ‘Posts’. What if you wanted to hide the ‘Description’ column for Post Category? So what we did above was to first check if this is the correct taxonomy (classification of items – in our case, ‘category’). Once we know we’re editing the correct columns, we have an array $columns of the column names, and we just unset this array item. It will no longer appear in the column list – neither header rows nor data row. This is called by the filter ‘manage_edit-category_columns’. That looks a lot tidier. 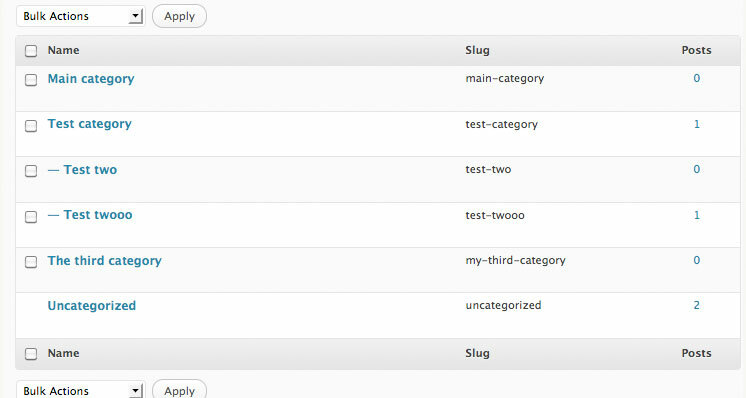 We can also do the same to remove the slug column by unsetting the ‘slug’ array item. The name of the hook is dependent on the taxonomy, so for a ‘people’ taxonomy ‘manage_edit-category_columns’ becomes ‘manage_edit-people_columns’. So that was removing a column, but what about adding a column of data. This would be relevant if you have meta data stored with each category (maybe using the Category Meta plugin, or a method somewhat like on this post), or perhaps you wish to display another piece of data to the user. In this case, you add an array item to the columns list in the ‘manage_edit-categories_columns’ hook containing your column name, and also hook onto the ‘manage_category_custom_column’ hook. So we have added a column with an index of ‘my_column’, and a visual title of ‘My Column’. And as you can see, we have our test data showing. In terms of showing specific data per category term, use the $term_id as your specific identifier to get any meta data associated with this category. I hope this was useful – if so, please let me know on the comments. Any queries please let me know. Thanks a lot, I looked for this hook name. One issue I have with this, is that the field is being added on the top of the category list as one lone line, instead of being put inside each table cell. Do you have an idea why is that? I use the same analogy in the manage_posts_custom_column and there the data is being displayed as it should be. Well, I found the solution, might be helpful for others. and then you should return the data, and not echo it, and then it’s ok.. 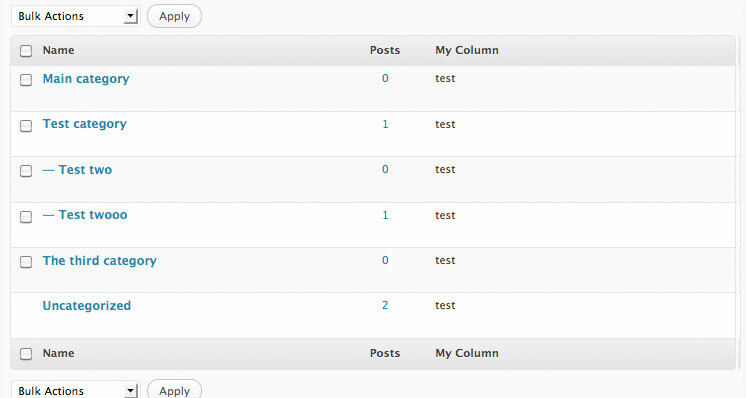 This looks great, i havent try it yet, but i would like to know, if after i create the custom column “My Column”, can I set it info from the backend?? ?, just like the description or slug fields??? please write me back to: luisdiegore@hotmail.com, i’ll preciated any help. Is there any tutorial how to edit Custom taxanomeies already embedded in theme? Hi, regarding the first example (removing ‘description’) where exactly do i paste the provided code? i tried adding it at the bottom of wp-admin/edit-tags.php without any success. sorry if this is a newbie question..
so sorry, completely slipped my mind – the obvious answer is functions.php and it works. Glad you found it – yes, in your theme’s functions.php (or in your plugin), rather than anywhere in wp-admin.